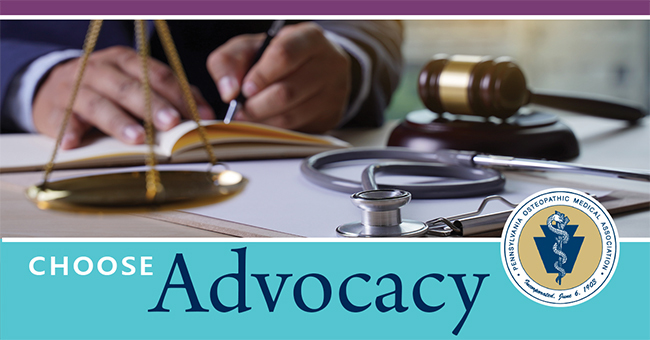 The House Professional Licensure Committee held a public hearing on House Bill 789 which amends the Medical Practice Act by codifying existing regulations for the provision of anesthesia in certain settings. Affected stakeholders continue to meet in an effort to reach compromise to minimize financial exposure to patients who have received out of network services. HB 1553 is currently awaiting full House consideration pending the outcome of these discussions. We ask you to reach out to your legislator when they are in their respective district over the course of the next few weeks. Elected officials are more available and receptive to contact from their constituents in the districts. Express your opposition (in person is best or by telephone, AND in writing) on this issue relative to CRNP Legislation (HB 100, SB 25). POMA has emailed and sent a hard copy of our opposition letter to all House members in advance of your contact. Your one-on-one interaction is our most effective tool to influence this issue. Efforts by the CRNPs are continuing in an effort to advance consideration of House Bill 100 currently before the House Professional Licensure Committee. Their ongoing efforts are to persuade rank and file members to push leadership to consider the proposal. House leadership has communicated to POMA and other stakeholders to assess the possibilities of formulating amendatory language to the proposal. The nurse practitioners will hold their annual Main Capitol rally on April 17, 2018 at 11:30 am. Governor Wolf is expected to renew his 90-day opioid disaster declaration. On Jan. 10, 2018 the governor first declared a state of disaster emergency with regard to opioids, an uncommon use of Pennsylvania’s disaster emergency statute, but which allows Commonwealth agencies to use all available resources and personnel, as necessary, to cope with the magnitude and severity of the situation. In the past, states of emergency, normal bid and contract procedures, as well as other formalities prescribed by law, have been waived for the duration of the proclamation.